Watch journalist and friend of the show, Kristian Haagen, made a few great photographs of one of my favourite watches, the Patek Philippe Nautilus. His version, the chronograph, is the 40.5mm ref.5980/1A and uses an in-house caliber CH 28-520 C movement. I mention in-house, because for a long time, Patek Philippe was relying on chronograph calibers built by Lemania. This particular chronograph has a mono counter for both the hours and minutes totalizer. 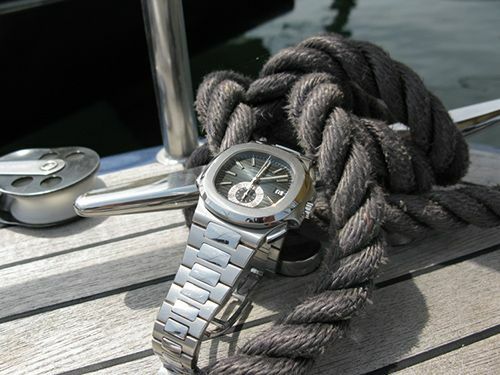 As you can see below, Kristian took pictures of his Patek in its natural (and nautical) environment. As the 5711/1A remains my favourite version of the Nautilus, this chronograph is surely more up to date in terms of design (thicker case and bracelet). I tried both versions (5711/1A and 5980/1A) the day before yesterday, at the Tourneau TimeMachine boutique on 57th street in New York and was amazed how comfortable the chronograph version sits on the wrist in comparison to the more basic 5711/1A. Something to think about when the time is there to purchase one. Kristian demonstrates his photographing skills and his wonderful Nautilus Chronograph over at the Public Forum on TimeZone. Click here to see his other pictures as well. The finish of both the mechanical automatic chronograph movement, case and bracelet are just top notch. 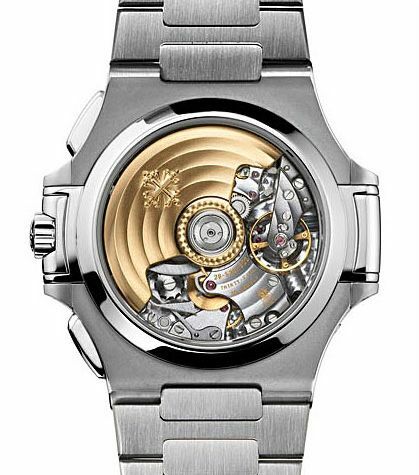 Expect to pay around 27.500 Euro / 34.000 USD for this piece of haute horlogerie.